Look at this face! Aren't we lucky? And as much as it breaks my heart, I am so very thankful for it. I'm thankful that she knows how to tell us that something is wrong, so we can help her survive. It wasn't an easy road to get to this place. Lots of three-hour cry sessions happened before we would figure out what she wanted. One piece of the puzzle at a time. I think there is a learning curve for all babies, but sometimes I feel bad that Rooney is our first and has to deal with all our mistakes. We often thank her for her patience with us. We put in the time, and now we get to enjoy the benefits. Eric and I believe that we know Rooney's needs better than anyone else and can give her what she needs quickly, when she needs it. It's kind of funny when other people do something for her and we think, oh, she doesn't like it like that. We kind of forget what you don't know about her unless...you know. Unless you've been around since day one. When she pushes the bottle away from her mouth, she needs to burp. She likes when you burp her firmly. None of those soft pats. After she's done burping, she will throw her head back...meaning she's ready for more. When the bottle runs dry, you better take it out of her mouth, shake it a little, and show her that it's gone. Otherwise she doesn't believe you. A combination of rocking, bouncing and patting will soothe her the fastest when she's upset. 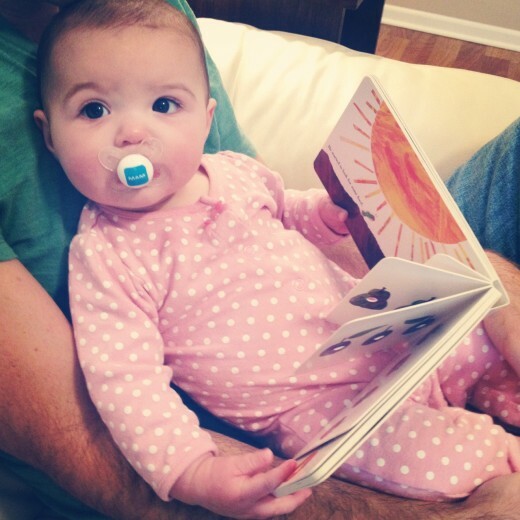 She needs the pacifier to get herself to sleep (although we're working on that this week...). After being held for a while, if she starts to fuss, it means she just wants to kick and roll and play independently on the floor. I love learning her little quirks. And I'm praying that we keep listening to what she is telling us, even when she can use words. It'll seem easier then to know what she wants, but in some ways--especially when we're teenagers--we aren't as transparent, are we?